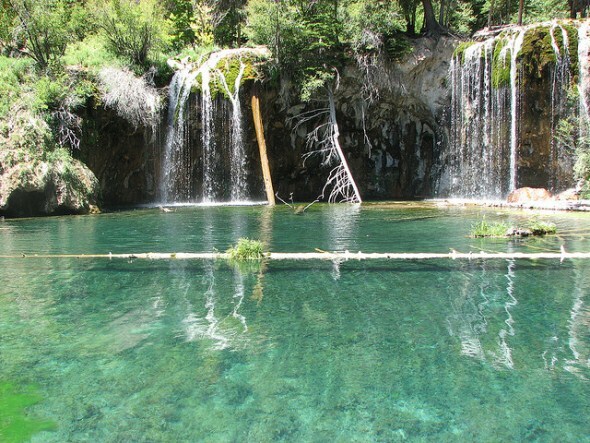 Hanging Lake is a crystal-clear, turquoise-blue lake suspended on the edge of Glenwood Canyon about seven miles east of Glenwood Springs. The 1 1/2-mile hike to the lake is rated “difficult” by the U.S. Forest Service because it climbs 936 feet to the top of Glenwood Canyon, at 7,323 feet in elevation. The hike will take about two hours round-trip, depending on stops to rest or take photos. The trail is very popular, particularly during the summer and fall months, and dogs are prohibited on the trail because of the crowds. At times, the parking lot reaches capacity, and forest rangers must turn away visitors. The trail follows Deadhorse Creek up Deadhorse Canyon, and most of it is tree-covered, a relief in hot weather. The trail crosses the creek several times on wooden bridges. Sections of the trail are rocky, and steep stairs are carved into the rock near the top. The trail ends on a boardwalk around the Hanging Lake, and visitors are encouraged to say on the boardwalk to protect the lake edge, which is composed of dissolved carbonates that are deposited on the shore as the water flows over the edge. Getting body oils into the water will stop the deposit of the carbonates. Swimming and wading are prohibited. The water in the lake is so clear that trout can be seen as much as 20 feet away, but fishing and feeding the fish are prohibited. The 1 1/2-acre lake was formed by a geologic fault that caused the lake bed to drop away from the valley floor above. Water flows into the lake over Bridal Veil Falls. There is a short second trail that begins before the boardwalk and leads to Spouting Rock, where a waterfall spouts through a passage worn through the limestone. Below the waterfall is a shallow cave created by the water’s backsplash. The trail begins at the Hanging Lake Rest Stop (Exit 125), which is only accessible from the eastbound lanes of Interstate 70 because of the complexities involved in putting the highway through the canyon with the least disturbance to the environment. Westbound motorists must take the Grizzly Creek exit (Exit 121) and backtrack four miles to the Hanging Lake exit.